One of our primary landscape design goals is to select the right plant for each location on your property. However, there are some practical and functional considerations in that plant selection process that are complicated by our New England winters. 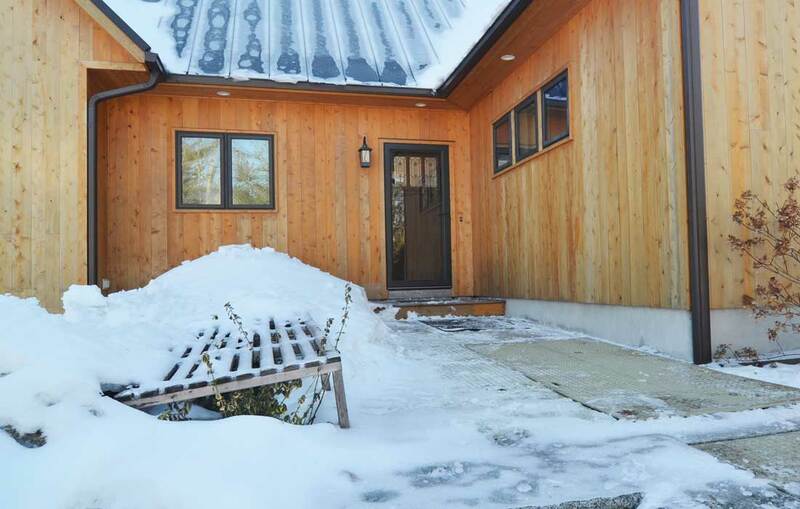 A property with winter exposure to environmental elements such as strong winds, blowing salt spray, road plowing, drifting snow and ice storms may require particular care of plant material to protect from winter damage. 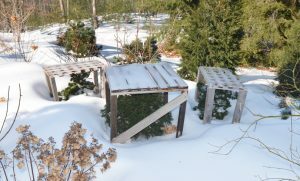 Larger evergreen plants and trees, in their first winter, may also require special attention if they have not been fully hydrated before the ground freezes. These conditions may turn some of the evergreen edges brown. Another more common issue is snow falling off a steep roof line onto plant material. We do encourage the use of stone drip edges along the house foundations which do subsequently move the planting beds out away from the house a bit further; however, the plant material may still be affected by the roof snow fall. The larger plant and tree material can be wrapped with burlap. We start wrapping at the base of the plant to support the upward curvature of the branches. We then tie up the plant or tree with twine for support and to hold the burlap in place. The smaller plant material can be protected by wooden frames which we build to size. The frame is built out of two by four and the top is made of one inch by three inch boards, spaced no more than one inch apart. Cross braces are used for sturdiness. A third issue for some locations is an active deer population. Deer really enjoy arborvitae and holly. You may have seen the lower branches of arborvitae disseminated by deer feeding. To protect against deer feeding, we wrap individual plant material with burlap and tie up for support. For a long row of arborvitae, we install stakes on both sides of the row of arborvitae and then secure the burlap with zip ties to the stakes. We use six foot wide burlap and start at ground level. On sites where we have installed evergreen plants and trees late in the planting season or where these is excessive salt spray and wind exposure, we may recommend that an arborist apply an anti-desiccant to reduce transpiration and desiccation during the winter months. Please give a call if you are concerned about your woody plants or evergreen plants and trees this winter. We will do a site visit and advise on the best method. You may also call us for advice if that is more convenient for you.